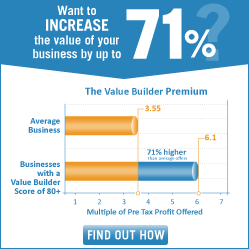 Value Builder Score - A Free Appraisal | Chinook Mergers, Acquisitions and Business Brokerage Ltd. The ultimate test of value for your business can be found in a simple question: Would someone want to buy your company? Whether you want to sell now or a decade from now, or pass on the business to your family, you need to build a valuable asset for the future. Is your business your largest asset? Achieve a Value Builder Score of 80+ and – based on our research from thousands of test cases – your company will be worth 71% more than the average business. Based on our research from thousands of test cases, your company will be worth 71% more than the average business if you can achieve a Value Builder Score of 80+. The Value Builder Score is an interactive tool that gives you a comprehensive assessment of the “sellability” of your business, whether you want to sell next year or just know you’re building a valuable asset for the future. When you complete the Sellability questionnaire, you’ll get an overall Value Builder Score out of 100 plus your score on the eight key drivers of Sellability, which are statistically proven to increase the value of your company.